Call this Chapter 70 in my occasional series, "The Road to Sprawlville." WI GOP Assembly Speaker Robin Vos managed in a state without two spare potholes-filling nickels to rub together to steer to and through his district a quarter of a billion federal and state road-and-interchange widening dollars that will trigger sprawl beyond bulldozed Mount Pleasant farms even if Foxconn never diverts a gallon of Lake Michigan water to produce a single big screen LCD TV. Look at it as an adjunct to the gerrymandering Vos helped create that serves his own interests - - interests his caucus wants to protect through litigation, voter suppression and power-grabbing lame-duck legislating. Gerrymandering lets legislators pick their own voters and pack them into favorably-drawn legislative districts. Spending gobs of public highway money to serve those constituents with cars - - to hell with transit and those lowly bus riders, as Vos has indicated - - and attract more businesses, residents and voters moving into new subdivisions keeps the whole self-serving, incumbent-preserving, sprawl-inducing wheel moving with Vos' friendly hand at the helm. 2/7/18 update - - And as One Wisconsin Now is reporting, Vos owns several businesses and real estate in the area where the transportation infrastructure is being substantially upgraded. Vos’ financial disclosures reveal his significant personal wealth that includes millions in real estate holdings and businesses incorporated as Robin J. Vos Enterprises, Inc. and Romata LLP. Romata owns property assessed as manufacturing that houses popcorn manufacturing and packing operations under the corporate umbrella of Robin J. Vos Enterprises. Note how many people in Vos' Racine County are lower-income.transit dependent, according to United Way data. Here is my Foxconn archive, fully-updated, since Walker scribbled out the deal on one sheet of paper in June, 2017. Foxconn might leave some egg on Vos's face, but he can mix it with the bigger servings of bacon he's bringing home - - a meal that will keep him and his allies full for years. [Update: Foxconn tells WISN-TV's Sunday morning host Mike Gousha it is "surprised" it is not being welcomed with open arms. For years on this blog I posted stories about destructive 'planning' in Wisconsin under the title "The Road to Sprawlville." Chapter 4 was about the proposed re-purposing of "Cow Corner" in the Village of Wales for a Walgreen's and some retail stores; posts often focused on Waukesha County projects and paving, sometimes with photographs. Wherein we renew our long-running series "The Road To Sprawlville" and revisit frequent stop Pabst Farms - - the planned 'community' on Western Waukesha County cornfields where stalled development and dead dreams of a Bayshore-style mall have lapsed into litigation with the city that lavished millions of dollars in subsidies on the site. For the record, earlier posts in my occasional series about Sprawlville, are here, (on the road to Ft. Atkinson), here (in Dousman), and here (somewhat of a detour - - on the $25 million "diamond-design" I-94 interchange planned to service the planned upscale shopping mall at Pabst Farms, Sprawlville's Capital City). And the State Legislature is doing its best to bring Sprawlville to Dane County, showcasing how Team Walker continues to serve the 'pave-it-over' crowd. But given what we now know about Foxconn - - an extensive archive about the project since July, 2017, is here - - its 3,000 rural acres headed for bulldozing, piping in daily of millions of diverted Great Lakes water, generation of massive amounts of polluted wastewater and dirty air emissions, exemptions from environmental impact reviews, clean air standards, wetlands-filling protections, and inducement of heavy traffic in and out of the project on vastly-expanded roads, it's time for me to remove the title "Sprawlville's Capital City" from Pabst Farms to the west and award it to the Foxconn site in Mount Pleasant. Where the official ground-breaking, and a rally in protest, are scheduled for June 28th. Walker wants the area designed "Wisconn Valley," thinking that his inventing a brand with tortured language somehow makes real a link with Silicon Valley. But what he's doing, rather paradoxically, is firming up the notion of a con and calling attention to what he and his public-policy renegades deleting from both "conservation" and "conservatism:"
Abandoning any pretense to supporting clean air and water. And violating what fiscally-conservative GOP politicians used to stand for: local control, private property rights, restrained borrowing and avoiding the use of government to pick marketplace winners and losers. So the 69th chapter of "The Road to Sprawlville" now runs from State Capitol to rural Racine County and right through to Mount Pleasant by bulldozing the land, diverting the water, polluting the air and evading or breaking traditional Wisconsin practices and values. 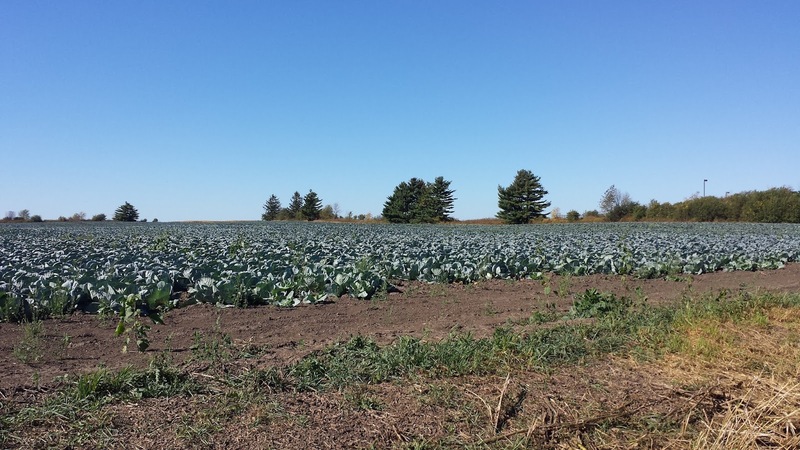 Thousands of acres like this cabbage field shown here in 2017 are now in an area designed 'blighted,' available to be seized by local government for Foxconn uses and 'developed' with public funds. Great article. A win-win for Vos and a lose-lose for the rest of us. I hope the politics of resentment catch up with him. Our gov't has a long history of personal self interest in government and business interests. We also don't manage sprawl except locally where cities and counties adopt zoning laws. More damaging is Voss's Ayran, or Ayn Randian, neo-fascist, profits above government approach that seeks to dismantle government. Reduce taxes on the wealthiest, reduce gov't revenues, bust all social programs for privatization. Market forces will take care of sprawl. We need to marshal rural and urban forces to defeat gerrymandering and GOP dominance. Send Ayn Rand back to Russia. New York City to Amazon: Don't Foxconn us. Trump just couldn't let it go. He is a fool.